Well, this is my very first book review and I'm grateful for the opportunity to provide a brief review of this book. When the author, Martin Murphy, contacted me via Twitter, he asked me to review the book from a seminary perspective. One of the courses any seminarian will take will be a course on Systematic Theology, which is an excellent subject to learn more about all of the doctrines found in Scripture. This past year in seminary, I read Millard Erickson's book, Christian Theology and it was good, a long and thick book and one that I'll use as a reference in the future. 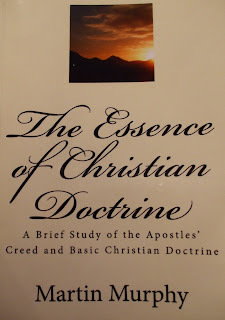 This book, The Essence of Christian Doctrine, A brief study of the apostles' creed and basic Christian doctrine is an excellent read and one that should accompany any other book a seminarian has in their library. 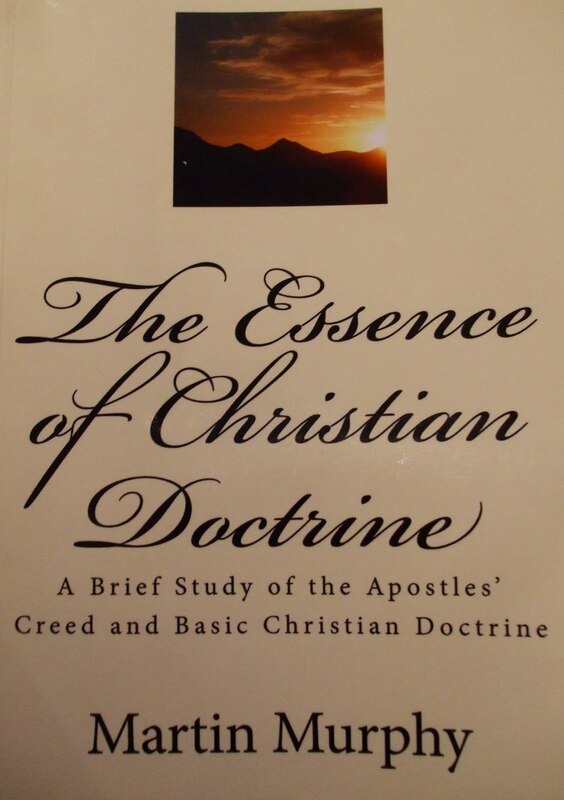 The contents of the book are not exclusively for the benefit of seminary students either, but an excellent opportunity, for anyone to be refreshed in understanding Christian doctrine through the Apostle's Creed. I attended a Catholic school as a child and I remember reciting the Apostle's Creed, even memorizing it in 8th grade for a assignment. The Apostle's Creed was also something I heard recited often on a Sunday morning too when my family attend Mass, but we never knew the deeper meaning of the creed, nor were taught its significance regarding its biblical foundation either. I don't suppose much has changed since then in the Catholic church where parishioners simply repeat the creed in robotic form rather than knowing the foundation upon which it has been given to the church. This book helped to discover that and I am grateful for the time and effort Martin Murphy has devoted to this work, to provide such a simple theological understanding of the Apostle's Creed. When I read chapter 9, Holy Catholic Church, Martin Murphy provides an excellent explanation what a Holy Catholic Church means and what it is supposed to represent. Many catholics do not know that the word catholic refers to a Greek word, katholikos, which means universal and that is what the church is to be, a known universal Christian entity where the teaching is based on the inspired word of God. Murphy says that the catholic church, "The true church has no boundaries thus it is not parochial, but rather it is evangelical." (p. 69) So true! The latter part of the book provides a basic theological understanding of the doctrine of sin, salvation and sanctification, which provide for the reader a simple understanding of these doctrines and the significance of these doctrines regarding the life and ministry of the church and the Christian believer. He also covers some additional topics too, which I was not disappointed by either, because they added so much more value to what I had read. Chapter 21, Living by God's Law was very good, probably my favorite chapter of the book to read because of the Ten Commandments. The author says, "Sermons dealing with the full nature, extent and interpretations of the law of God have been absent from pulpits in this country for over a century" (p. 160) and he's absolutely right. Many pastors in modern Christianity no longer exposit the Ten Commandments because they have adapted to avoiding an understanding of the commandments, in favor of being more relevant with people and providing sermons that are more applicable to their lives. They'd rather delight you in their eloquence so as not to offend someone, rather than devote themselves to teaching doctrine and winning their souls to Christ. Martin provides a brief, yet solid explanation of the Ten Commandments in this chapter and any reader would have a much better understanding of the commandments, as they relate to God and living by His law because of the atoning sacrifice of Christ, after reading this chapter. This is an excellent book and one that I would recommend people to read. Whether someone is in seminary or not, a new believer or a seasoned one, or someone who is seeking to understand more about what they may have heard as a child when they attended a catholic mass, this book will add to your life an understanding of this creed, more than you realize. Martin was gracious to send to me another work of his, The god of the Church Growth Movement, which I have no doubt will be as good as The Essence of Christian Doctrine. Pastor Phil Morgan has provided a review of the book as well and you may read it here.